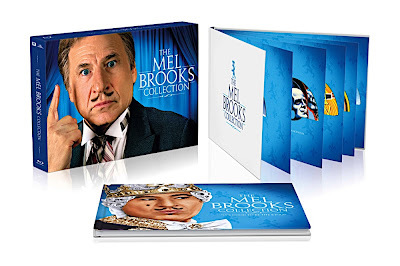 Fresh off the success of his Oscar winning comedy classic The Producers-- which is tragically left out of this otherwise definitive Blu-ray collection-- writer/director Mel Brooks became the second filmmaker to send up Ilf and Petrov's 1928 novel, The Twelve Chairs exactly 25 years after the previous version It's in the Bag! hit the silver screen in 1945. 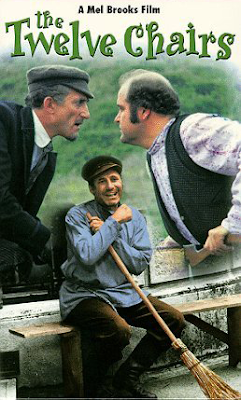 Although he used the original title from Ilf and Petrov's novel, The Twelve Chairs and paid further homage to the source material by setting the film in its Russian homeland exactly one year before the book's publication, there's no mistaking 1970's Chairs for anything other than a Mel Brooks movie. 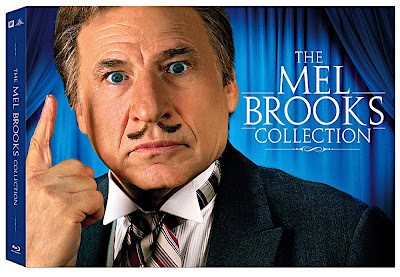 A fascinating find for Brooks enthusiasts, Chairs also marks an ambitious turning point for the former TV joke writer turned filmmaker in his refusal to give us more of the same by venturing out of his directorial comfort zone of the Producers world of theatre and show business that he knew all too well. While it isn't as successful from start to finish as The Producers was and still is to this day, Chairs solidified the Brooks style and gave the auteur the opportunity to explore a world beyond his instantly recognizable gag-a-minute approach. By incorporating physical comedy into Chairs, Brooks drew inspiration from the American movie slapstick of Charlie Chaplin, Buster Keaton, and Harold Lloyd, which was immensely popular during the era in which this film takes place. 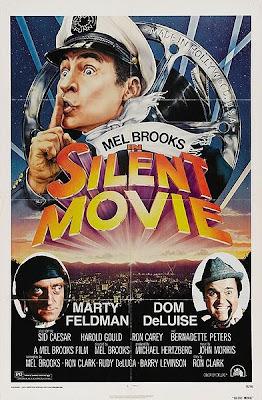 Of course, Brooks revisited this era of comedy on a far more thorough level with his star-filled extravaganza Silent Movie a few years later. 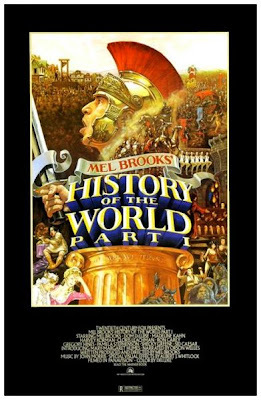 However, when viewed 40 years after its release, it's evident that Twelve Chairs offered him both the experience and therefore the confidence necessary to formulate the Mel Brooks comedy modus operandi. While some filmmakers opted to follow the “everything but the kitchen sink” rule of balancing humor and filmmaking on an even level, for Mel Brooks, the figurative “kitchen sink” was fair game as well, as long as he thought it was funny. And with the exception of To Be or Not to Be, which was based on the classic '40s production and wasn't written or directed by Brooks who starred opposite his late wife Anne Bancroft, The Twelve Chairs is the only title contained in this 9-disc Blu-ray collection that has a very well-developed plot-line that seems to have been conceived well before the jokes were tossed around. Needless to say this tale of a trio of men determined to find a fortune in family jewels that had been sewn into the cushion of a recently deceased matriarch's chairs doesn't have as many genuinely hilarious moments as Frankenstein or quite as much tongue-in-cheek self-referential humor as Spaceballs but unlike the rest, it hasn't aged one bit. 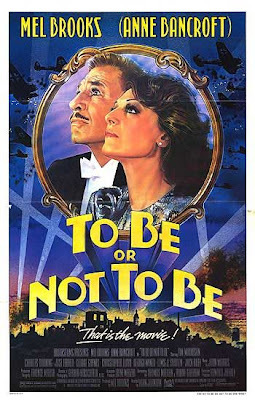 With a sensational Blu-ray transfer that rivals an impossibly young Frank Langella in the debate of if the film or Langella is more beautiful in high-definition, this period film along with To Be or Not to Be benefits from the fact that both seemed to have originated from a strong plot-heavy script. Obviously, you're not going to watch these as often as the rest. Yet regardless of that, the screenplays are so strong that either production could inspire more comedies down the road whether on stage or screen. In fact, even when Chairs began to spiral out of control midway through the production, I couldn't help thinking that the idea of a mislaid family treasure would be the ideal back-story for a freewheeling British production with minimal sets like Death at a Funeral or Noises Off. 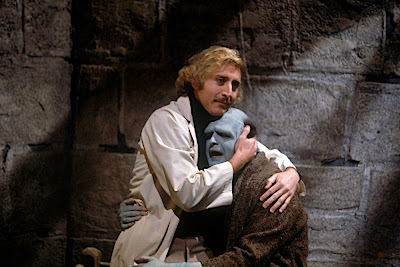 This is in stark contrast to his usual brand of comedy utilized in Brooks' highly successful affectionate spoofs of westerns in Blazing Saddles, vintage horror movies such as Young Frankenstein, the pre-talkie era with Silent Movie, the oeuvre of Alfred Hitchcock in High Anxiety, a Monty Python meets SNL tinged epic spoof like History of the World Part I, science fiction in Spaceballs, or swashbuckling pictures with Robin Hood: Men in Tights. 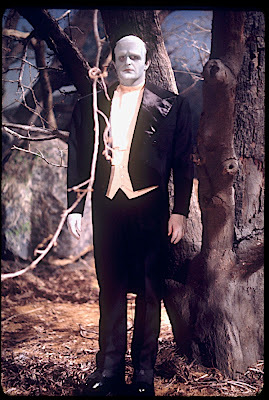 In addition to enjoying his love of music, which was there right from the very beginning and in retrospect foreshadowed his move to Broadway in the 21st century, I gained a greater appreciation for the dedication that Brooks and his collaborators showed in collecting knowledge of the films and individuals they were spoofing. 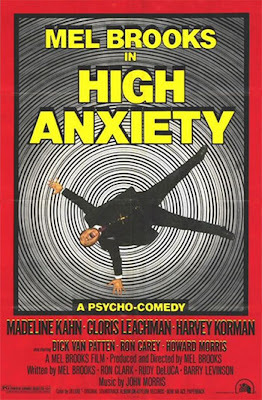 To this end, Brooks proved to be quite a sensitive academic, requesting the blessings of both George Lucas and Alfred Hitchcock before he made Spaceballs and High Anxiety to prove that imitation is the wittiest form of flattery indeed. This being said and much like the spoofs that play in theatres today, the humor's all over the map. Unfortunately as a veteran gag writer, Brooks never abandoned the idea that every film was improved upon with as many jokes he could squeeze into any given scene, with little regard as to whether or not they actually worked or served the story well. 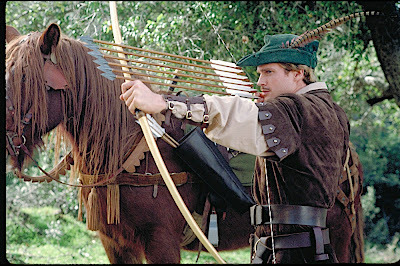 While luckily the humor hits more often than it misses, when it does miss, the figurative sound of the microphone dropping and a comedian walking offstage can throw his films off-balance completely, as witnessed in Robin Hood: Men in Tights, which feels like a '90s time capsule of toilet jokes. 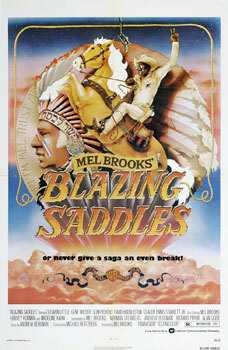 Although fortunately, even when Brooks fouls out, he's able to keep making easy baskets until the momentum returns as evidenced in the rapid misfire of jokes during a few uneven Blazing Saddles sequences that temporarily leave viewers with a bad aftertaste. And in the same token, as seen in a few truly priceless setups such as Paul Newman's wheelchair race in Silent Movie, which was influenced by the Keystone Kops and Buster Keaton, when Brooks manages to hit the perfect rhythm even sporadically it will make you overlook the chaos more often than not. Having been continuously impressed by Fox's Blu-ray quality, which regularly surpasses the high definition format of other studios, I'm thrilled to report that in a majority of the films, the picture manages to rid the prints of grain or old flaws so much that The Twelve Chairs and Silent Movie look brand new. 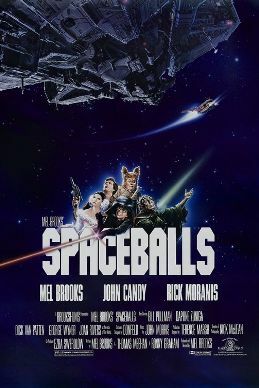 Surprisingly and despite its technical excellence in hiring more than two dozen Oscar winners in the behind-the-scenes department for Spaceballs so that at the very least the visuals could compete with Star Wars and Star Trek, the film makes an average level Blu-ray that still has a VHS like ghosting about it in darkly lit scenes. 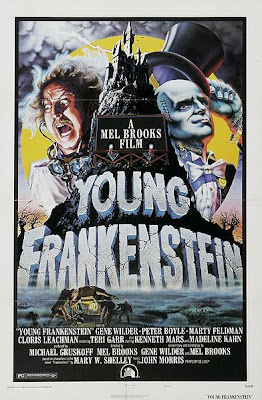 Still, the audio is quite good, especially in Young Frankenstein which ensures you're able to start picking up on jokes Brooks would repeat throughout his career like “walk this way." 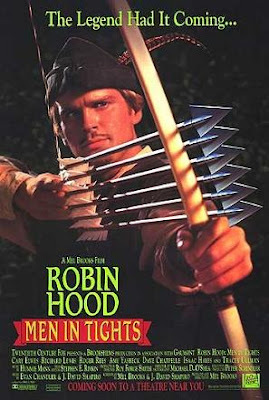 However the newest title Robin Hood suffered a bit from overly rosy flesh-tones and soft outlines, which were nonexistent in both Frankenstein's black and white print and the purposely Hollywood set bright Blazing Saddles transfer as well. Despite the fact that true fans will love having so many of Brooks' titles on Fox Blu-ray in one collection, the absence of The Producers is hard to overlook as is the fact that the cumbersome and fragile packaging made the binding on my set break the first time I opened it. 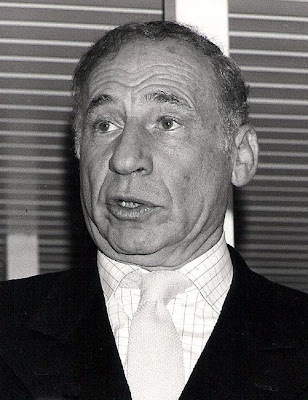 An American icon who was recently honored by the Kennedy Center in 2009-- because of the value of not just the set but our cinematic history as well-- Mel Brooks' titles would've been best served if they were protected in smaller or slim-cased packaging instead of this photo album presentation wherein the discs simply slide into pages, largely unprotected. While the binding is somewhat fixed with clear packing tape, admittedly it lowers the collector's value of the release and I for one think I'd probably prefer to keep the discs in cases regardless, especially when you browse some of the fun new trivia tracks and documentaries included throughout. However, Fox more than makes up for the inconvenience of a binding that falls apart with as Mel Brooks would say “one sweetheart of a good time” to be had with the inclusion of a hardback, fact and photo filled, 120 page exclusive book called “It's Good to Be the King." FTC Disclosure: Per standard critical practice, I received a review copy of this item from 20th Century Fox Home Entertainment to evaluate for this article which had no bearing on my judgment.